Never Enough Nails: Back-up Worthy: Lynnderella When the Moon Was a Star!! 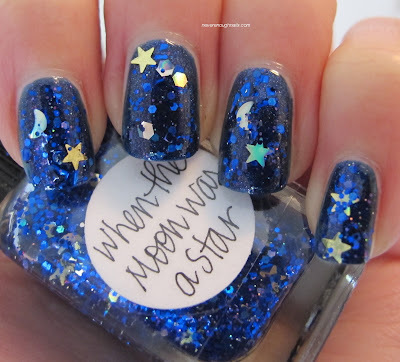 Back-up Worthy: Lynnderella When the Moon Was a Star!! *Gasp* Is it weird that I took these pictures, and wore this mani for 5 days, and looking at it still make me drool all over the place?? 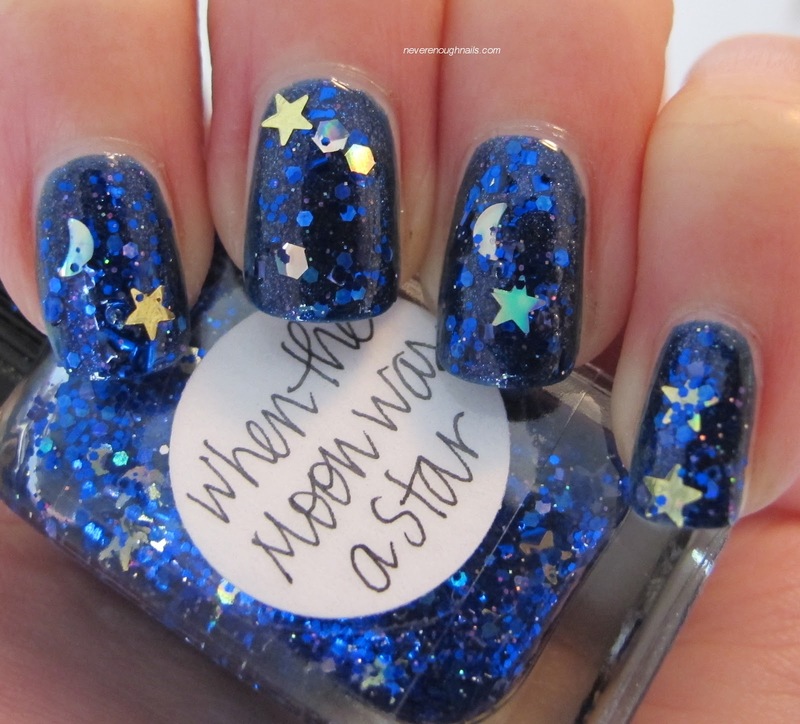 I am going to require a second bottle of Lynnderella When the Moon Was a Star. I know this because using it makes my heart hurt a little bit. Like I'm afraid I'm going to use it all up in two uses. This was the most fascinating mani I've worn in ages, possibly ever. This is two coats of Lynnderella When the Moon Was a Star over two coats of Nicole by OPI If the Blue Fits. 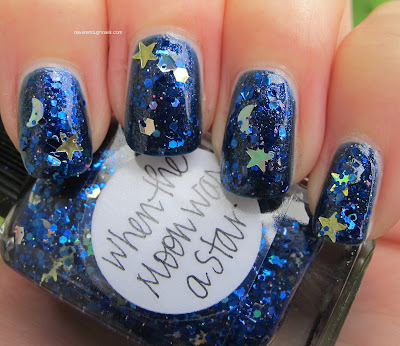 The picture above is a bit blurry, but I wanted you to see that the moons and stars are holo!!! 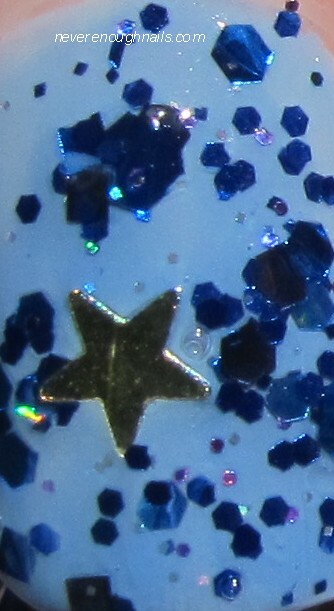 You can see this best on my ring finger. 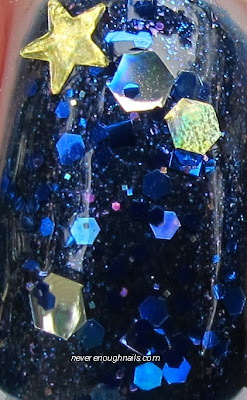 Some of the small glitter is holo too (look at my pinkie). 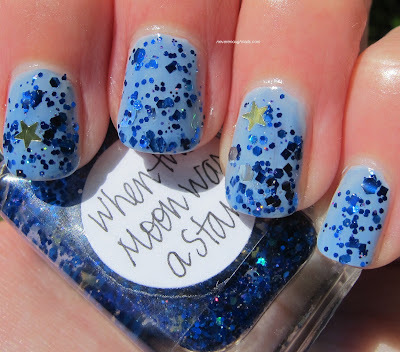 It wasn't very difficult to get all of these moons and stars onto my nails either. I applied one coat normally. 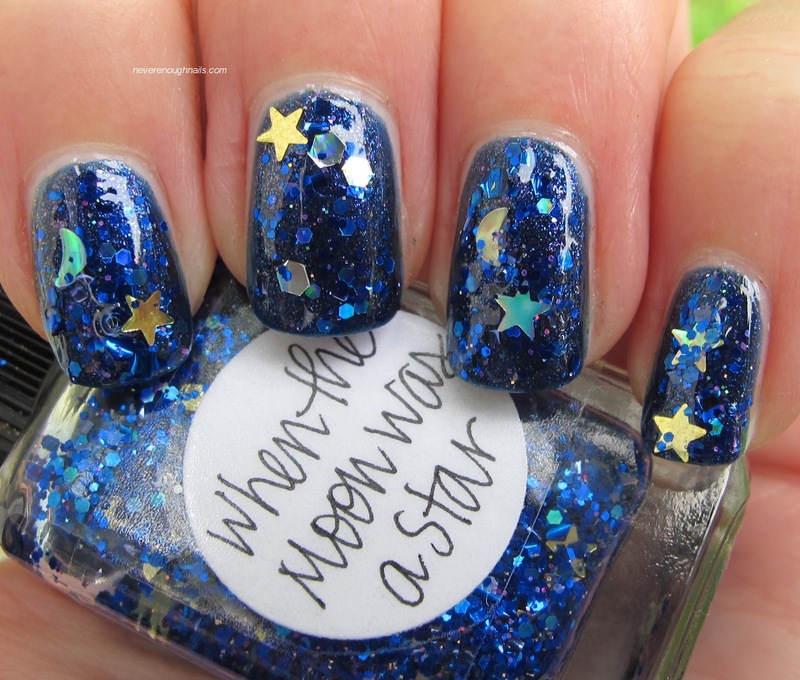 For the second coat, I fished the brush around until I got some stars or moons on there, then wiped them on to the neck of the bottle. From there, I picked them up again with the brush and applied them to my nail. The extra step of putting them on the neck of the bottle helped them come off easily on the nail. You know I've been trying to show you two different base colors with these Lynnderellas, but the first look was so perfect I had a hard time figuring out what second base to show you. I ended up with two coats of Zoya Kristen, a pale blue gray creme. 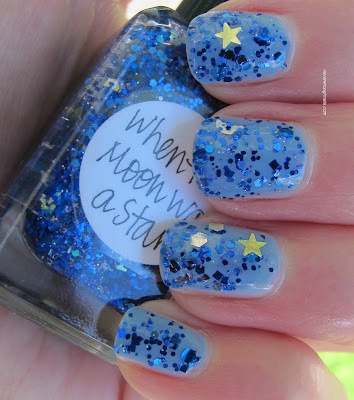 This base color makes the blue glitter really pop, but the moons and stars don't stand out as much. 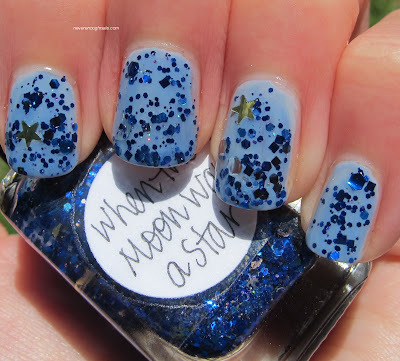 This was two coats of When the Moon Was a Star over Kristen. 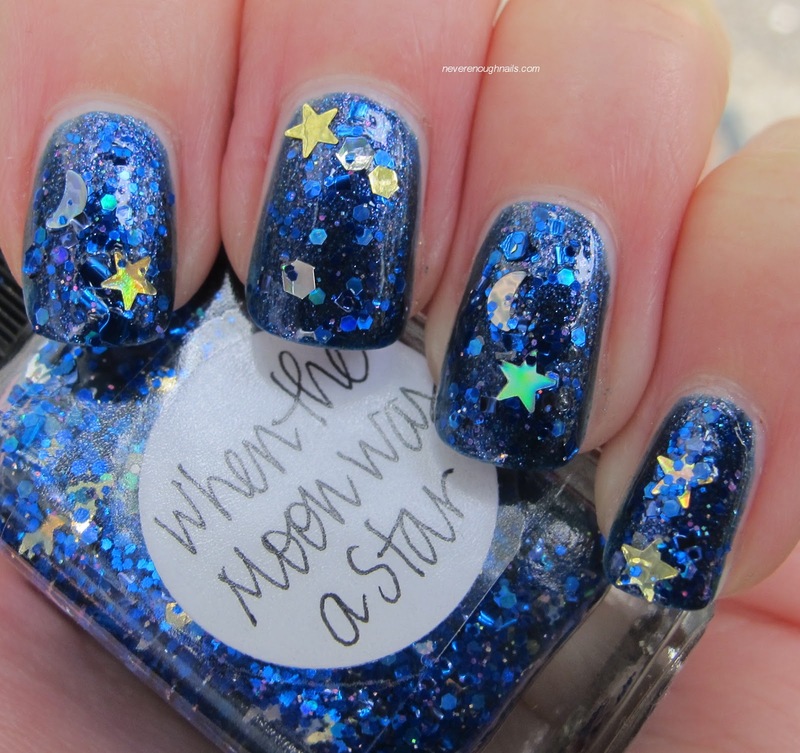 It looks really beautiful of course, but I definitely like the darker base to make the moons and stars really shine!! Lynnderella polishes are available on her eBay store. I like the first combo best! Very pretty! I like the first combo best too. Me too Heather and TikiBarbie! You never know with Lynnderellas though, so I like to experiment with lots of different bases!